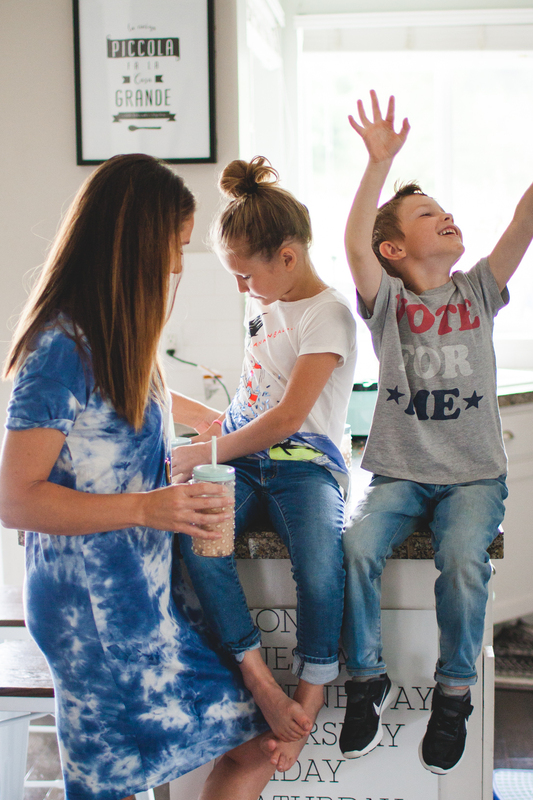 I think the anticipation of summer with kids is a lot like the beginning of pregnancy… you get so excited about all the fun parts that you forget about how much work it is! One of hardest parts about summer for me is actually keeping everyone fed. Especially on days we’re home. 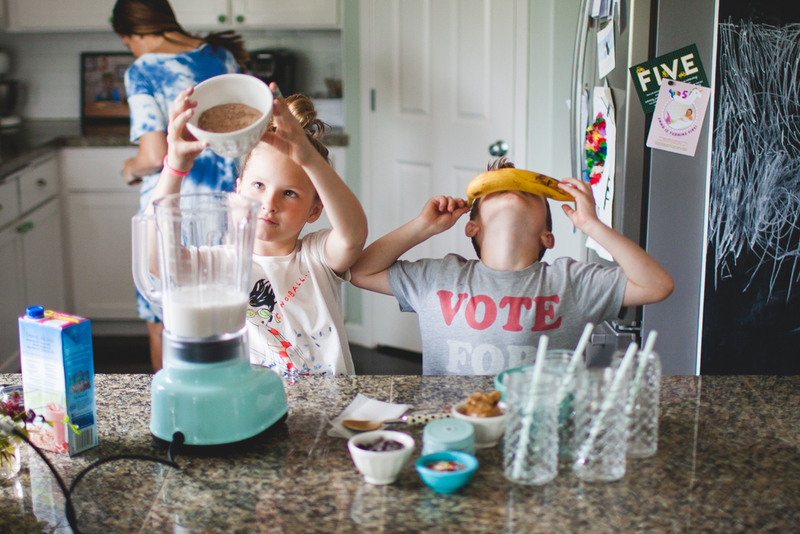 Because our schedule stays pretty loose, there is a ton of snacking going on between breakfast and dinner (lots of fruit, popcorn, edamame, hummus and guac happening) which makes it hard to tell who is eating what and if anyone is actually full. Anytime I need a break from hearing the words, “I’m hungry” (which I hear more than, “I’m bored”), or from tidying up the kitchen that is honestly never clean during the summer, I have two options 1) I can make an actual lunch meal and make everyone sit together and eat or I can 2) make a protein shake I know they’ll love that also fills them up and that’s portable. Most of the time it’s a no-brainer and I go for the shake. I’ll share our go-to combo below! 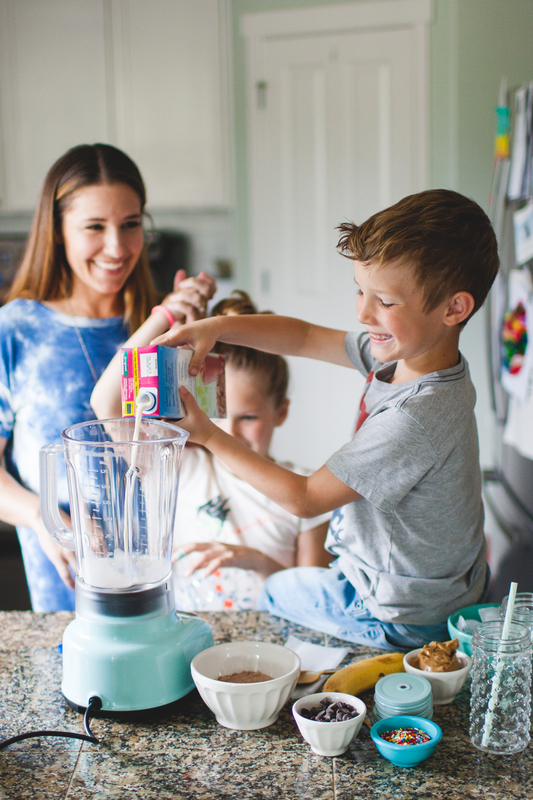 Oh, and I got a lot of questions about what blender and protein (that isn’t chalky) we use in my last smoothie post so will add those links below too. Place first 4 ingredients in blender and blend until combined, but not frothy. Add ice to taste and desired thickness and blend. 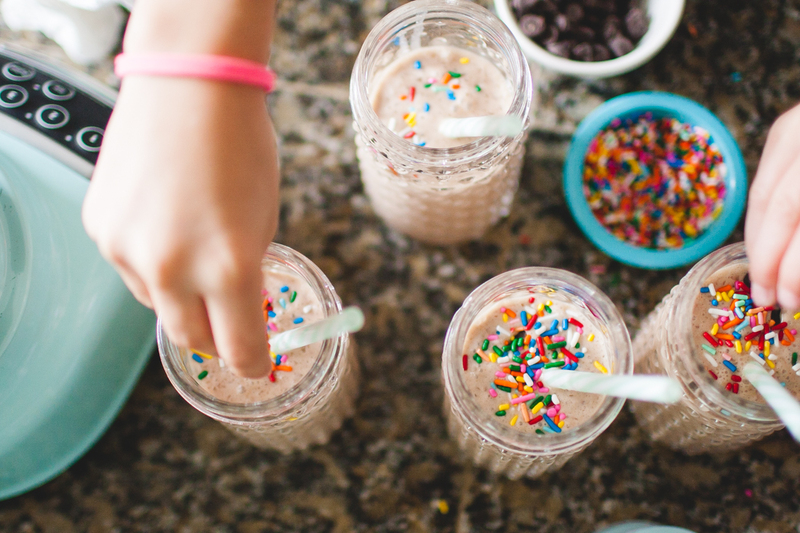 Pour in cups and garnish with sprinkles and chocolate chips! Serve to your monkeys or enjoy yourself! Favorite protein mix is THIS. 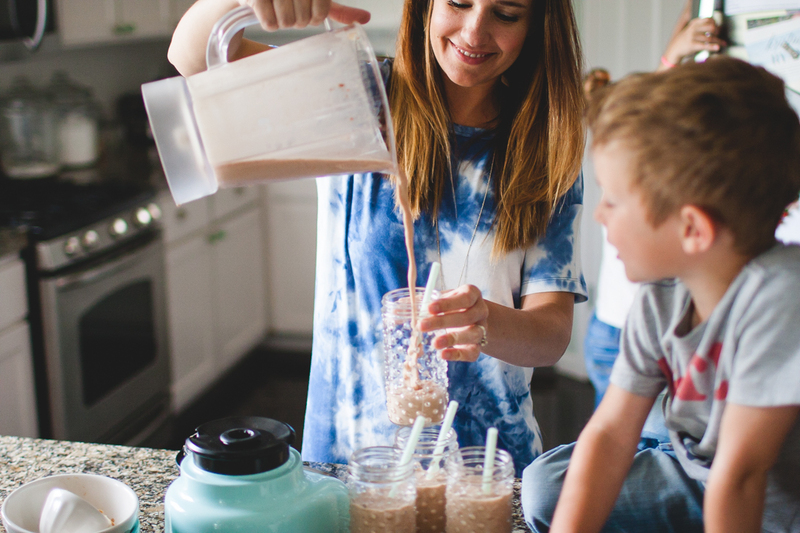 It’s spendy, but if you break it down per serving and the fact that it’s almost a meal replacement for the little ones, it makes it feel more reasonable. The flavor pictured is extreme milk chocolate and it’s a hit in our home. 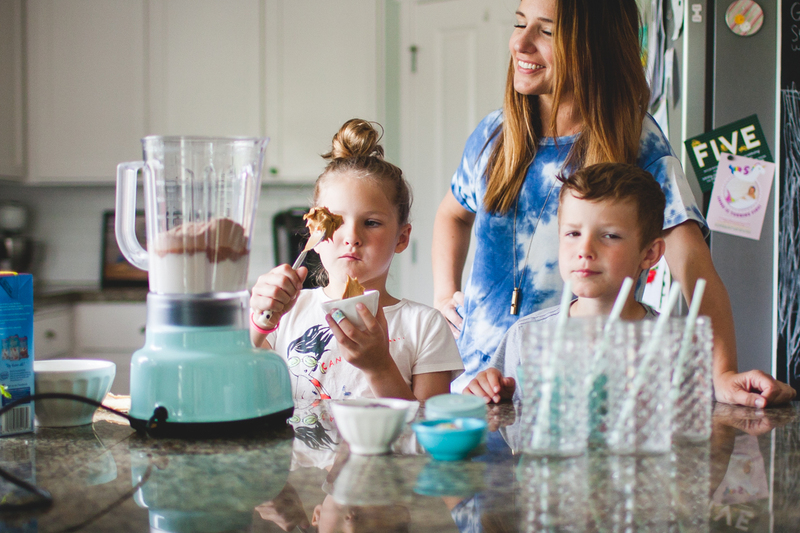 As far as blenders go, we’ve used a ninja for years. It worked great at first but the blades dulled quickly and we’ve just been putting up with it. Johan’s been wanting to buy a vitamix and there is a great deal on one at Costco right now ($350!) but with all of our summer expenses (camps, swimming, Birthdays, etc.) 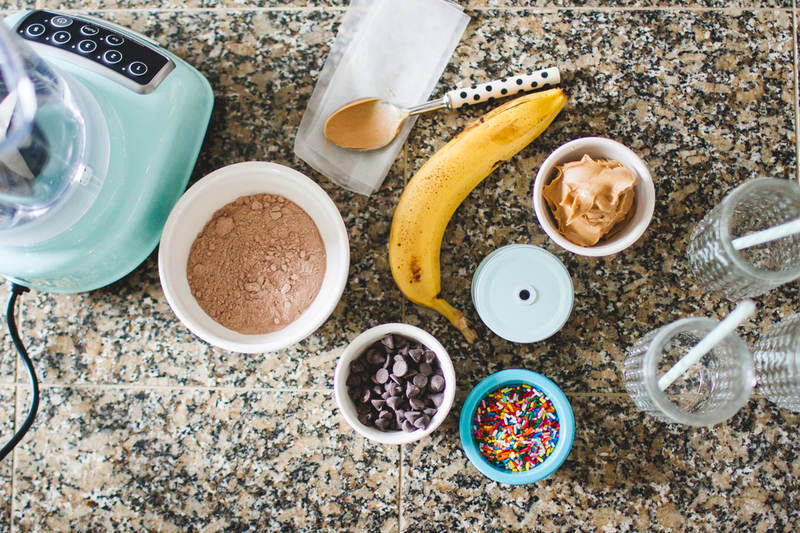 I talked him into THIS kitchen aid blender and it works great so far! 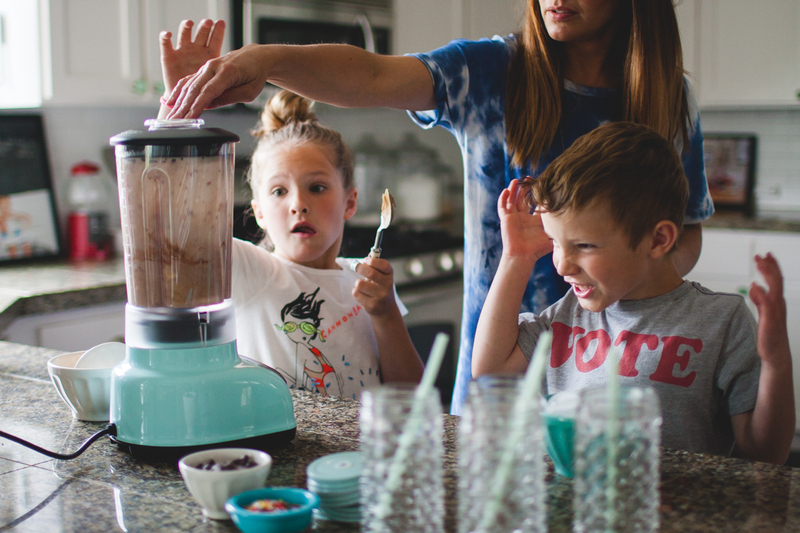 Sprinkles makes everything more appetizing and fun to eat… not that these yummy shakes need any help. It’s really so good. We recently purchased that same blender and hopefully we’ll use it this weekend. I was worried about the lid because there’s no suction but after calling KitchenAid I am more confident about using it. 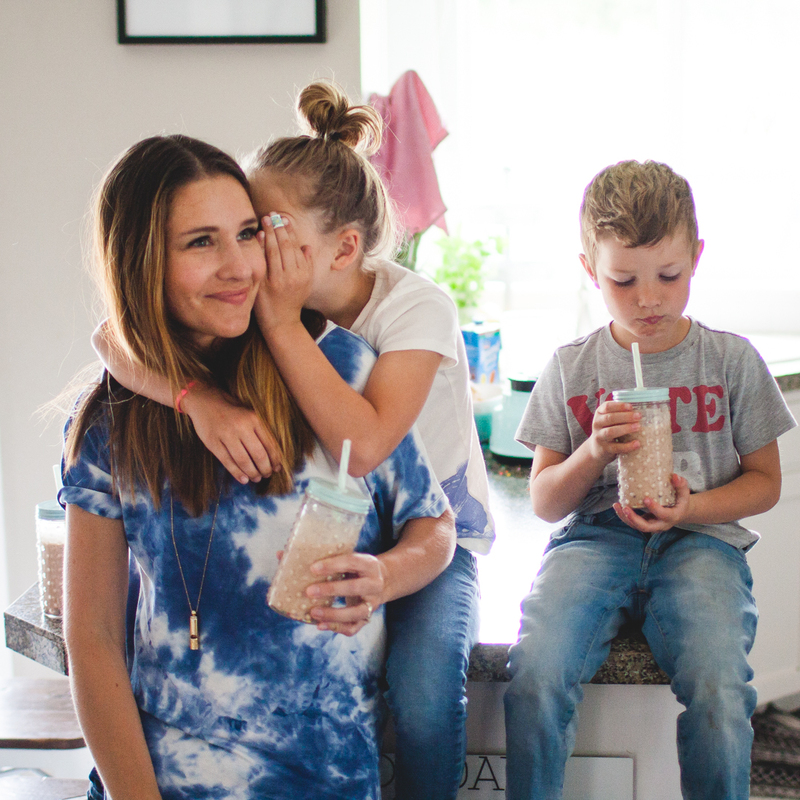 I have a chocolate milk lover so this smoothie should be a hit. Where did you get those adorable cups with the lids? I didn’t even see your note and saw them there today! They didn’t have the blue lids but still grabbed up six! Super score!! 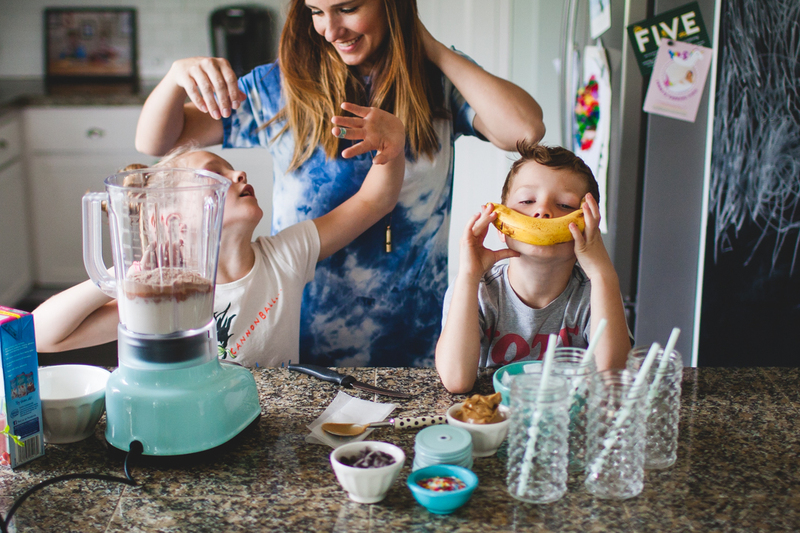 Yes, I’m also interested in those glasses because smoothies are forever spilling around our table! Red! It’s my favorite color.